DOT Art & Event Programming commissions and oversees the installation of temporary public artwork on DOT property throughout the five boroughs and curates and manages programming at annual large-scale, car-free events including, Summer Streets and Car Free Earth Day. 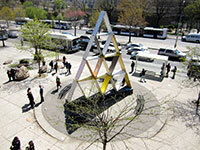 Public art and event programming activates the public realm and enhances the quality of life for all New Yorkers. Temporary public artwork beautifies DOT infrastructure by transforming sidewalks, fences, triangles, medians, bridges, jersey barriers, step streets, public plazas and pedestrianized spaces into canvases and foundations for colorful murals, dynamic projections and eye-catching sculptures installed by artists in partnership with community based-nonprofit organizations. Event programming is presented through three categories: public art, performance and activities relating to environmentalism, outdoor recreation, arts and culture, and health and wellness. In addition, DOT Art coordinates conservation and maintenance of DOT’s permanent art collection and collaborates with the NYC Department of Cultural Affairs (DCLA) Percent for Art Program to commission permanent art as part of the Percent for Art law. The DOT Art Advisory Committee reviews proposals based on the following criteria: public safety, artistic merit, site suitability and artwork durability. Committee members are elected every two years and represent all five boroughs and a variety of arts disciplines. Who is eligible to apply and to which Program Track? Individual artists are invited to apply to Community Commissions and Barrier Beautification, however, organizations and artists must apply jointly for Arterventions. Applications can be submitted with each new deadline or open call. Artists are only eligible to receive one commission per fiscal year. What are the roles and responsibilities of the Project Team? DOT Art staff, the artist, a representative from the partner organization and other NYCDOT officials make up the project team. Throughout implementation, the project team meets to plan and review the design, budget, engineering and legal agreements. The artist is responsible for design and fabrication of the artwork. The partner organization is responsible for overseeing fabrication and installation, maintaining artwork during the display period, removing artwork upon completion of the display period, restoring the site to its original condition and when relevant, processing funds from DOT to the artist. How are proposals reviewed and selected? The Art Advisory Committee, a panel of appointed arts professionals from varying disciplines, reviews all proposals based on the following Selection Criteria: artistic merit, site suitability, public safety, artwork durability and organizational capacity. The Committee will not review incomplete applications. Applicants are notified of selection within one month of the submission deadline. Funding is not guaranteed with project selection. Selected projects are typically implemented within six months of notification. Are projects presented outside of the four Program Tracks? Yes, NYCDOT occasionally partners with external stakeholders to produce large-scale special projects. For these projects, NYCDOT releases an open call inviting artists to submit proposals for review by a project-specific committee. 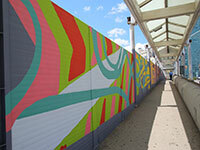 Examples of past projects outside of the four Program Tracks include: Asphalt Art Activations, Summer Streets Interventions, and Construction Fence Banner Wraps. Visit www.flickr.com/photos/nycstreets to view photos of past special projects. 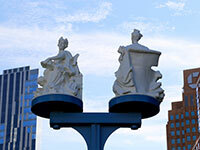 What is NYCDOT’s role in installing permanent public art? NYCDOT works closely with the NYC Department of Cultural Affairs (DCLA) Percent for Art Program to commission permanent art as part of capital construction projects. DCLA organizes selection panels to review potential artists chosen from an Image Registry. Artists may submit registration forms to the Registry at: Percent for Art, Department of Cultural Affairs; 31 Chambers Street, 2nd Floor; New York, NY 10007. For more information, visit: nyc.gov/culture. Download DOT Art FAQ (pdf). Who is eligible to apply to program Summer Streets and Car Free Earth Day? Professional artists, performers and nonprofit organizations regardless of residence are eligible to apply to present public art installations, dance, music and theatrical performances, and workshops or demonstrations at both events. Where is programming permitted at Summer Streets and Car Free Earth Day? At Summer Streets, programming is not permitted on the event corridor (Park Avenue, Lafayette Street and Centre Street) but is permitted at five rest stops: Uptown (51st Street and Park Avenue), Midtown (25th Street and Park Avenue), Astor Place (Astor Place and Lafayette Street), Soho (Spring Street and Lafayette Street), and Foley Square (Duane Street and Centre Street). At Car Free Earth Day, programming is also not permitted on the event corridor (Broadway) but is permitted at the five rest stops: Times Square (42nd Street and Broadway), Herald Square (34th Street and Broadway), Garment (39th Street and Broadway), Flatiron (23rd Street and Broadway), and Union Square (17th Street and Broadway). All art installations, performances and workshops/demonstrations may only take place during event dates and hours. Are performers or programming partners able to accept donations or sell merchandise along the route? All programming must be free and accessible to the public. All partners are unable to accept donations or sell merchandise during event dates and hours. What does DOT provide to the programming partners? At both Summer Streets and Car Free Earth Day, DOT provides equipment (tents, tables, chairs and linens) to the workshop partners at no cost. At Summer Streets, a 12 foot by 16 foot stage, PA system and sound tech are available to performers, whereas at Car Free Earth Day, only a PA system and sound tech are available. What legal agreements are required to present programming at Summer Streets and Car Free Earth Day? Nonprofit organizations, performers and artists must sign a legal agreement with DOT and, when necessary, provide a certificate of insurance naming DOT and the event producer as an additional insured. DOT provides the necessary permits to install artwork on City-owned property during event dates and hours. When will partners receive payment for their services rendered at Summer Streets and Car Free Earth Day? All artists, performers and nonprofit organizations will receive payment upon completion of services rendered and may invoice the Monday following the event. DOT Art presents temporary public art on DOT-owned plazas, fences, medians, triangles, sidewalks and step streets in all five boroughs. Applicants should review the Community Commissions RFP for a list of priority sites, or the Site Selection Tips when suggesting a location for Arterventions. As part of Arterventions, organizations and artists are invited to select DOT-owned sites within their communities to beautify with artwork. When selecting a potential site for art, consider the following guidelines: Size + Safety (large enough to accommodate artwork), Visibility + Accessibility (accessible to a diverse audience) and Site Enhancement + Significance (aesthetically pleasing and appropriate for the public realm). 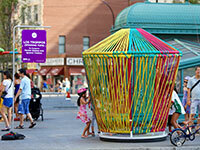 DOT Art only presents temporary art installations on DOT owned and maintained property. The DOT Land Use Unit assists in reviewing all incoming requests. When proposing a site, be sure to include the street intersection and borough in question. All site inquiries may be emailed to: arts@dot.nyc.gov. Download Site Selection Tips (pdf). For all programs, DOT provides the necessary permits to install art or present programming on City-owned property. In most cases, a certificate of insurance must be provided naming the City as an additional insured. For Community Commissions, DOT arranges for an engineering review by a NYS licensed engineer; whereas for Arterventions, the applicant is responsible for hiring an engineer to prepare the necessary documentation. Partner organizations and/or artists are required to sign a legal agreement with DOT and provide a certificate of insurance naming the City as an additional insured. As per the agreement, the artist receives credit, sole ownership, and copyright of the final design and artwork, but is required to extend to the City and the partner organization the right to a royalty-free, perpetual license to use any depiction of the artwork for non-commercial purposes. All DOT Art installations are required to use a 12” x 18” aluminum sign that is designed by DOT Graphics, printed by the DOT Sign Shop and installed by DOT Borough Engineering on street light poles adjacent to the artwork location.